Earlier this year we were all surprised about just how funny the film Instant Family was. Now the same thing has happened with Fighting With My Family. The story of a wrestler that comes from nothing and chases their dream – it sounds like a story we have heard a million times before. Only this isn’t just another wrestler – it is the story of Paige and the result is a feature film that mixes comedy and drama together amazingly well. Fighting With My Family opens in cinemas this Thursday. 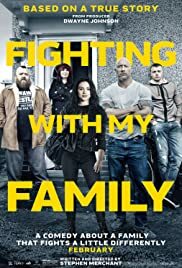 Director: Stephen MerchantWriters: Stephen MerchantStars: Dwayne Johnson, Lena Headey, Vince VaughnSummary: A former wrestler and his family make a living performing at small venues around the country while his kids dream of joining World Wrestling Entertainment.